The Louisville Zoo is teaming up with Kroger for our Wild Winter Days program. Visitors who bring in one canned good item (per person) will receive an additional $1.00 off adult or child admission winter pricing. The offer is valid for regular daytime admission and not for Santa’s Safari, other special fee-based programs, for prepaid groups of 15 or more, school field trips or with other discounts unless noted. (No refunds provided on prepaid advance or online tickets.) Multiple cans are appreciated but only one can is required per person for the discount. Additional cans do not provide additional discounts. To date, the Zoo has collected nearly 25,000 pounds of food thanks to the generosity of its visitors. This will be the sixth year of our partnership. Some of Dare to Care Food Bank’s most needed items are peanut butter, soup, canned fruit, beans, rice, tuna, cereal, fruit juice, pasta and canned vegetables. For more information on Dare to Care, visit daretocare.org. 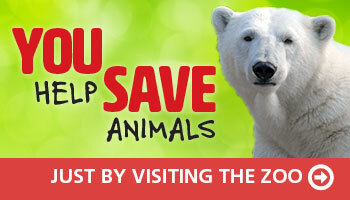 Don’t forget to sign up for Kroger Community Rewards and support your Zoo at no cost to you! The Zoo is open daily year round. Fall/winter hours continue through March 15, 2019, 10 a.m. ─ 4 p.m. (stay until 5 p.m.). The Zoo is closed on Thanksgiving, Christmas and New Year’s Day.